Well that was an interesting General Election to say the least. Given what I tried to do at work to inform staff and get them access to the candidates so they can ask questions, and the Bournemouth Echo publishing some pieces about it, I wanted to do another quick blog post to catch up and close things off. It was good to see one member of staff driving to Southampton and back that night just to cast a vote. Another person had gone to the voting booth with the intention of spoiling the paper but changed their mind at the last minute. Votes do count. In an area of the country that is very much a sea of blue, as in all Conservative MPs, there was a surge in Labour voters compared to the previous two elections. This may be aligned to the national campaigns and may also be connected to the aftermath of the Brexit vote and the conjecture that the younger voters just did not turn out. Prior to the deadline for voter registration, there was a noticeable surge in the numbers of voters in the bottom two age brackets. Although the Conservative MPs held their seats in Bournemouth East and West, the Labour candidates both had an increase of around 10,000 votes compared to 2015, which primarily came at the expense of UKIP and Green voters. The Liberal Democrats stayed around the same. An increase in 10,000 for the Labour votes was a surprise to me given the backdrop of the local area, but probably less of a surprise given the polls and the momentum of the national campaign. I reiterate the point that every vote does count. There is no such thing as a safe seat. Canterbury has been a Conservative seat for 99 years but now a Labour seat with only 187 votes the difference. The SNP held the seat of Fife North East by 2 votes. Having a “strong” government can equally mean a government that is too authoritative or one that is too complacent. We have to ensure our local MPs are held to account, and reminded to represent the whole community. I don’t have any statistics on the younger votes but will update this when I do get them. (These are based on estimations from Ipsos MORI survey as it is a secret ballot and no way of identifying votes and their voters.) In 2015, the 18-24 age group had a 43% turnout and the 25-34 age group a 54% turnout. In Bournemouth East, where I live, the turnout was 65.2% compared to 62.55% in 2015. The Conservative vote went up 2.7% to 51.9%. In Bournemouth West, where I work, the turnout was 60.8% compared to 58.45% in 2015. The Conservative vote went up by 5.3% to 53.5%. Those are very high percentages for the Conservative vote, and both have increased since 2015. The other parties have to take the momentum of their gains and translate that into the local elections, with the added point that resident EU nationals can vote in that. National turnout was 68.7% compared to 66.1% in 2015. You can see an interesting graph on voter turnout on the following link, which shows turnout just fell away after the 1992 elections and have only been slowly rising since its lowest point in 2001. All I can say at this moment is that I am glad there has been increased numbers across the board in terms of turnout. Too early to understand the finer details just yet, but I hope the engagement continues to the local elections in future where people can make more impact to the local area and create a more diverse spread of representation. I thank again Conor Burns, David Stokes and Jon Nicholas on their engagement and participation with my staff and I. Get the Shuck outta here! Oh shucks, that was a great Southbourne oyster festival (OK, enough puns already)! 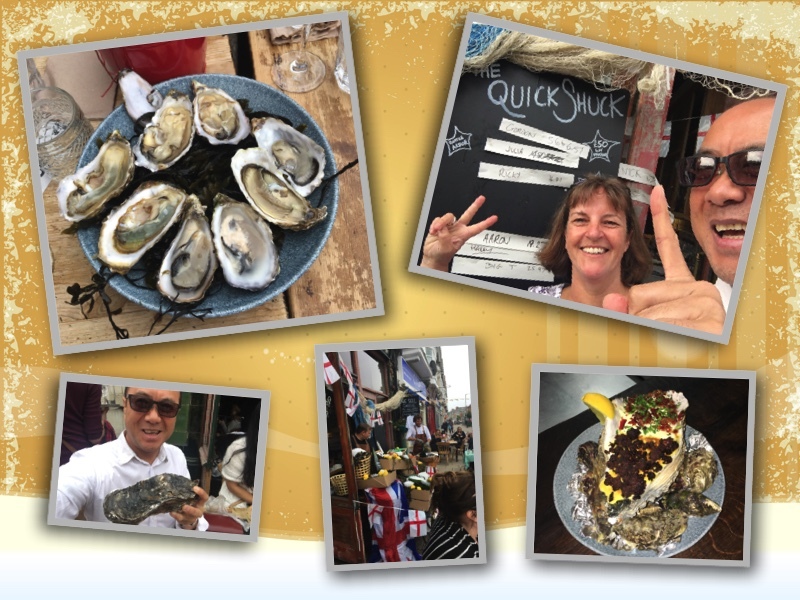 The Larder House held an oyster festival on Bank Holiday Monday, 29/5/2017. The weather was a bit misty and a bit windy, but maybe that fitted in with a seafaring theme. Thousands of oysters had been order coming in from Ireland, France, Cornwall and Poole Bay all ready for us to chow down on. There was even two 5 year old monsters on show as well. Not sure how such a beast would taste, but it got baked with cheese and black pudding at the end of the day, once James was able to hack his way into the thing. To get things going as nobody else had registered a time on the board, I got Salvatore up and we had a little mini-competition. I may have been a little bit cocky in my win by doing a knife drop as I walked away, but the crowd seemed to like it. In my next round I got totally destroyed by Chef Nick. Well played sir. By now I found the error of my ways. I was just my wooden holder too much, which meant the oyster shell was getting jammed into it as I prised the lid open. Now with me just holding the oyster down tightly, and risking severing the arteries in my wrist I was able to improve my time to just over 6 seconds. Being egged on by the glorious crowd I had one final attempt. There is no artistry in this final shuck, no finesse, just the desire to go sub 6 seconds. It was like Top Gear as my timing got placed onto the leaderboard. 5.66 seconds, the crowd went wild and I went to the toilet to clean up. My Instagram video is below. The look on Megan's face you'd think she was going to throw up in horror. We had a fantastic few hours there and a big thank you to James and the Larder House team for putting on a great event. 2017 General Election - Digital Businesses, do what you do best. This article is not intended to persuade you to vote for any particular party but to call for as many people who are eligible to vote to actually do so. Many people say the First Past the Post voting system is not ideal, and that Proportional Representation is a better alternative. But you have to vote for change and make your voice heard, regardless of the voting system. The Government recently reversed its decision to increase National Insurance for the self-employed following a public backlash; this shows your voice can cause a Government U-turn in a matter of days. Things don’t stop after the ballot paper has been completed. Politicians should always be held accountable and be ready to justify their voting record. We can’t always get what we want, especially if the party that we voted for, or our favoured candidate, does not win. But having a strong opposition is crucial for a strong democracy – and strong unity is required in times of crisis. Voter registration and participation levels are horrifically low in the UK, and I am sure all parties want this to change. MPs and Governments can be elected even if they attract only a small percentage of the vote when compared with the actual number of people eligible or registered to vote. This can raise questions about a government’s mandate to lead, and whether it truly represents the views of the nation. But, only the votes that are cast can be counted. We are now living in age where Social Media is hugely successful at engaging the public and raising awareness: viral campaigns like the ice bucket challenge, breast cancer fundraising initiatives and big corporates making their brands well known, are just a few examples. I regularly read and hear digital companies praising Social Media for raising awareness, getting strong messages out, fighting for just causes, conveying beliefs, being an effective communications channel and achieving very responsive engagement. I therefore can’t understand why Social Media, which is so popular among the demographic with a low voter participation rate, cannot be used to help reverse political apathy. I recognise there are many other ways to reach out to people, but as someone who runs companies in the IT and Digital Tech sectors, I question why we can’t apply the same principles and conversion rates when it comes to politics. The Bournemouth and Poole areas were highlighted in the 2017 Tech Nation report, and ranked highly as areas experiencing strong Digital Tech businesses growth. My feeling is that everyone involved in the local Digital Tech industry should be asking candidates their views on what they will do to help the sector and ensure it continues to thrive. Digital Tech business owners should make staff aware and encourage them to engage and participate in the election process. Read more: 2017 General Election - Digital Businesses, do what you do best. I went to the second of the Connected Bournemouth series of discussions and networking events, at the Steele Raymond offices last night. When we talk of Bournemouth, we mean the larger conurbation that encompasses Christchurch through to Poole in reality. There was a short talk by Chris Thorpe about robots, automation and Artificial Intelligence and the impacts that will bring to the employment. This was really interesting, an eye opener and very worrying if it all comes true. The central theme of the night's event was about how to give Bournemouth access to the best talented workforce. How to entice and retain? We broke off into smaller discussion groups and the feedback collated with the aim of the council enacting on key points raised. Being in London and not being there to run around from one business meeting to another can be really nice. 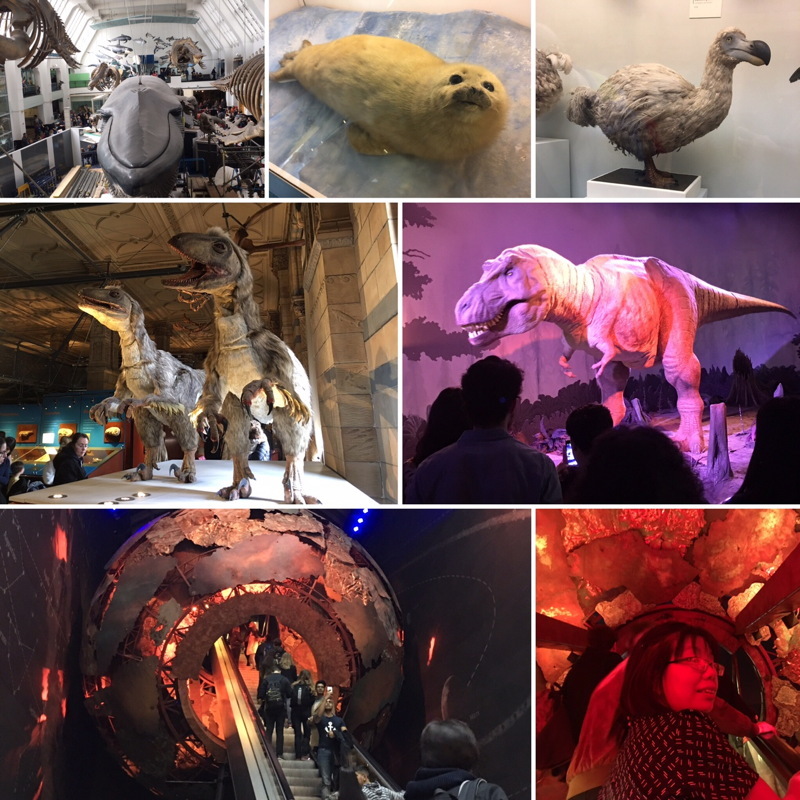 The aim was to get up early to beat the tourists on the East Weekend, but wasn't to be but we still did get to the Natural History Museum before midday. Not sure why we didn't enter by the nearest entrance on Exhibition Road from South Kensington tube station and instead walked to the other end on Queen's Gate but it doesn't really matter. I can't remember when and if I came here last time, but I made it my mission to do this museum and then the V&A. We didn't see the iconic Hintze Hall and Dippy the dinosaur as that was closed off, but we did see huge whales suspended in the air in one hall, and a fantastic Tyrannosaurus Rex moving model. Not sure you are the best parent when holding a screaming toddler at the front of the display in line with the roaring head. A bit slow moving at times what with families, buggies, backpacks and so on, but you just have to go with the flow - literally - and enjoy it. 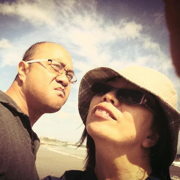 Aside from the awesome displays of the dinosaur bones, we both enjoyed the human biology section and the Earth section. We took a little break after the NHM and had a coffee with the best sausage roll I've tasted over at Gail's Artisan Bakery. There are plenty of eateries by South Kensington station for everyone's tastes.